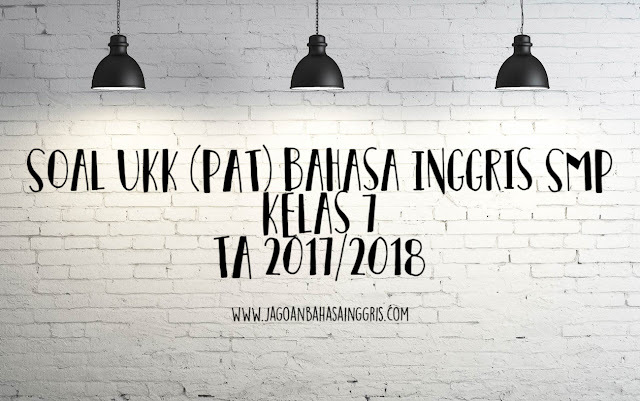 Tidak terasa akhir semester 2 sudah dekat, teman-teman semua pasti tidak sabar menunggu kenaikan kelas.Untuk mengatasi kecemasan kalian dalam menghadapi Ujian Kenaikan Kelas nanti kami ingin memberikan Soal UKK Bahasa Inggris SMP Kelas 7 ini agar teman-teman semua mendapatkan nilai yang bagus pada semester 2 kali ini. Untuk para guru juga, kami sangat senang jika artikel ini dapat membantu dalam pembuatan soal UAS di sekolah bapa dan ibu guru sekalian. Choose the correct answer by crossing a, b, c, or d! 1. Weni : Do you go jogging ? It’s good for your health, you know. Puti : I know, but I don’t have a friend to go jogging with. Weni : Why don’t you join me tomorrow ? Does Puti Go Jogging ? 2. Selly : Where is the biology book? A. Do I look good in this? B. What do you mean by this? C. What do you think about this? D. Does this suit me? 5. It's a big animal with a very hard skin and one or two horns on its nose. Lions, tigers, bears and wolves are wild animals. most of them belong to a prairie community. the basic life of prairie consists of the grasses. the grassland extend across central africa. the grass and other plants support large population of animals. many kinds of antelope, zebras, giraffes and other creatures graze on the grass. preying on them are lions and leopards. Lions and tigers prey on antelope, zebras and giraffes. wolves and mountain lions prey the deer. when deer are very numerous, their enemies become numerous too, because there is so much to feed upon. wild animal are found on a prairie, in the polar areas, in the forest and grasslands, and in the desert. In some countries there is a law against hunting wild animals. if someone breaks the law, he or she will surely be fined or punished. 7. Which statement is not true according to the text ? a. Wild animal do not live in the forests. c. Lions and tigers prey on antelope. d. Some countries have a law against hunting. Father : Sin, can you help me, please? Father : Can you get me the newspaper? Father : Emm… May be it’s on the table. Sinta : Yes, I got it. Father : Thanks for helping me. Sinta : It’s ok dad. Don’t worry, anytime. 10. In the text above Sinta is a …. girl. She is ready to help her father anytime. 11. How many characters are there in the dialogue above? 12. Cindy : We’re leaving. Anne : Wait for me! Cindy : ....... ! We’ll be late. Anne : Okay. I’m ready. Let’s go. 13. My father is a doctor. He examines … carefully. Mr. Fahri is very happy. The rainy season of this year makes the farm beautiful. It is planting time. Rice fields become fresh and green during this season and by the end of this season Mr. Fahri is ready to harvest his crops. Mr. Fahri plough the land at the beginning of the rainy season. Then, he usually works early and finishes at noon. Milking the cows, feeding the livestock, and cleaning the barns are among Mr. Fahri’s duties before breakfast. He does most of the hard outdoor work by himself. 14. What is a farm like during the rainy season? 15. When does Mr. Fahri’s workday end? 16. When does Mr. Fahri plough the land? Rania is my sister. She is a … (17). She works in a …. (18) of Sukabumi city. She helps the doctor and look after the patients. She gives the patients the …(19), and she often talks to them and listen their problem. 20. My father is a science teacher. He specialized in teaching living things. For example, he explains parts of a flower to his students. 21. Ryan : Get me a drink, please. Nadia : ...., wait a minute. 22. Find the wrong spelling in the underlined word below! 23. Which one of the following is the correct prohibition? A. Clean the blackboard, please! B. Wash your hands, please! C. Do your homework well! 24. Arrange the jumbled words below! Mice look cute, but they can be harmful pets that destroy household items, eat and mess with food and can spread severe diseases through their feces and parasites they carry. 1. Use peppermint, put the peppermint near wall corner. 2. Pour generous amount of peppermint oil on cotton balls. 3. Place the saturated cotton balls on areas where mice are possibly seen-around counter tops, under the sofas in your living room. 4. Put them behind shelves, wall corner or on the floor beneath your kitchen sink. A. Peppermint is fresh to breathe. B. mice love the peppermint. C. Mice will die of breathing mint. D. Mice hate the smell of peppermint. A. mice spread severe disease through feces. C. Peppermint is useful to repel mice. D. We can place oil everywhere to repel mice. 30. Nilam : What do you think of my new shoes?